It’s been a while since I did a Sunday post. Mostly because there has always been a lot of things on my mind (and plate), I’m going to try and write down my thoughts each week. This Sunday reflection, I’ve been reading the book of Matthew. I think I’m going to be on this book for a while, because it gives me a lot to think about. Lately, though, I have been worried. Not just lightly worried, but really worried. It seems these days I’m worried about a lot of things. Now, I know that God will provide, and nothing is too big for Him. Sometimes, I end up getting caught up in the day to day, that I worry more than I should. How much of my years is added by me worrying? Simple answer to that is no. We cannot add one year to our life worrying about the the things that we think is to come. The truth is, they may not even come true. What makes worrying so destructive, is that sometimes it can take over your life. You end up spending so much time worrying about the future that you forget to live in the present. You almost become consumed with your thoughts, and everything else is neglected. A healthy amount of worry is a necessary part of life, but when our worry consumes us, then we can see the ravaging affects that worry has on our health. What I have realized over the years, because I am a worrier, is that I have to let go, and let God. I am too little to do so many things on my own. When I notice that my thoughts are running away from me, then I have to take a moment and step back, and re-evulate my situation. Through prayer and just quiet time with me and God, I’m able to get back together, and have a clear mind to tackle anything. I know that cannot happen if I just worried. Are you a worrier? Do you find yourself consumed with thoughts? How do you get yourself back on track? 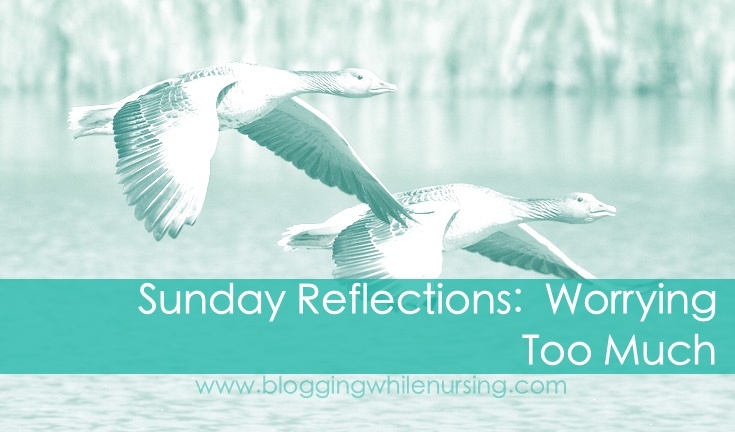 4 Comments on "Sunday Reflections: Worrying Too Much"
I hear you, I am an introvert by nature too, so I do spend a lot of time processing things. But sometimes, in my “processing” state, I end up over thinking everything, too much. I find that prayer does help with I am in my season of worry. Another thing that I do, er-learning to do- is trying to figure out of over thinking something is going to help. If not, I to focus on something else.